In news from Michigan, Bill 5977, which did not pass this session, will likely come up in January, would prohibit a local government, say, the City of Detroit, from creating a community benefits ordinance. For instance, the City of Detroit would not be allowed to set higher wage and benefits standards for its own residence when it has agreements with businesses. Now joining us to talk about this from Detroit, Michigan, is Frank Hammer. Frank is a retired General Motors employee, former president and chairman of Local 909 in Warren, Michigan. He’s a Detroit labor, community, and environmental activist. He’s also a board member of The Real News Network. Thank you so much for joining us again, Frank. FRANK HAMMER, COFOUNDER, AUTOWORKER CARAVAN: Thank you, Jaisal. NOOR: So, Frank, we know Bill 5977 is now kind of dead in the water, but it’s likely to be taken up again in Lansing. What exactly was it proposing? And what kind of impact would it have on cities like Detroit? HAMMER: Well, it emerged in the state legislature, which was in lame duck session. It’s Republican-controlled. It emerged in response to the City of Detroit City Council wanting to implement the first in the nation, which would be a community benefits ordinance, which would enable community coalitions to negotiate with developers on different projects that are kind of going on in the city, to make sure that communities had input into the development. And when the, say, legislature got wind of this, they rushed. 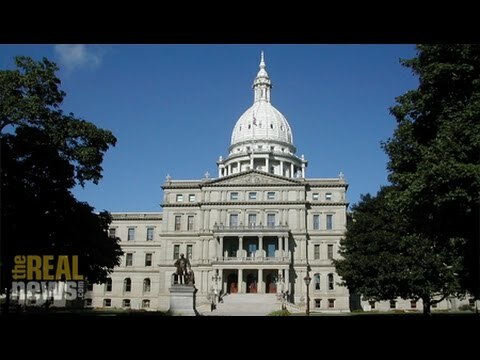 In fact, there was a Republican House member in Jackson, Michigan, who wanted to propose legislation that would bar Detroit, but actually all cities in Michigan, from getting such local community benefit ordinance agreements. So the impact would be to diminish the democracy that Detroit has already seen a huge impact as a result of the bankruptcy proceedings and would tie the hands of the city to whatever the state would agree the city could do, and if the state law prohibited the city from having such a community benefit agreement, then it wouldn’t happen in the city. And that would have been the effect of the legislation. NOOR: And what kind of impact would this have on labor standards, and how would this improve the community? We know Detroit has been devastated for decades now by a lack of investment. HAMMER: Well, if you listen to the developers, the community benefit agreements would be an obstacle to investment in the city. That is to say, they don’t want to engender any community input, and they want to have total sway in what happens in the city. The impact is that a city like Detroit, but other cities as well, would not be able to negotiate living-wage agreements, for example, or insist on living wage agreements with developers, and also in regards to the hiring. It would have broad ramifications for what would happen to both labor standards and to community benefits. NOOR: And I’m reading a piece in–hey, so, Frank, I’m reading a piece in Metro Times, and it kind of talks about how corporations previously have agreed to invest back in the communities, raise living standards. And they’ve gotten tax breaks in return. That happens in Detroit. It happens all over the country. But in the case of Marathon Petroleum, they fell well short of their required hiring of local Detroiters. And so this is a response to corporations failing to live up to their promises, which we see all over the country, but it’s a way to kind of hold them accountable for this. HAMMER: Yeah. We have no–there’s no significant leverage without these community benefit agreements. The situation with the city, for example, having to do with the construction of a new bridge to Canada, the new hockey arena, all these matters were subject to community benefit agreements, and the denial–their legislation in the state of Michigan will prevent city residents from insisting on certain hiring standards, insisting on certain environmental concerns. And Marathon is a good example of where you don’t have a community benefit agreement, that there it’s only promises. And that’s what the developers want, only promises. NOOR: And so we know this is going to likely come up in January in the next session in Lansing, your state capital. What kind of groups and individuals are lining up against this? And what kind of continued support is this measure going to receive? HAMMER: Well, I believe that the state legislature and the Republicans kind of tripped over their own feet in being in such a rush to pass this legislation in the lame-duck session. What’s happened is that even though you have the mayor, Duggan, opposed to the community benefit ordinance being proposed by the City Council, and also the head of something called the Detroit Economic Development Corporation coming out against it, they got caught off guard by this proposed legislation, because the proposed legislation would also undermine Mayor Duggan’s power as the mayor. So even though the mayor does not want the community ordinance, the benefit ordinance, he’s had to come out against the legislation. And so, come January, we’ll have to see how this–whether the state legislature will back off and entertain Duggan’s objections or whether they’re going to go through with it anyway. I think what’s notable is that the state legislature, the House committee that was considering this legislation, denied the head of the Detroit City Council, Brenda Jones, from speaking on this issue when they were considering it in committee. So it’s pretty aggressive against the city governmental structure. Lining up behind it, behind the defeat of that legislation, is a broad range of community organizations and community activists, including the Michigan Municipal League and many mainstream organizations that are advocates of democracy in Detroit. So I think you’re going to have a broad coalition of forces that are going to mobilize through January in opposition to the reintroduction of this legislation. NOOR: Well, Frank Hammer, thank you so much for joining us. NOOR: And we’re going to keep following this story. Thank you for joining us at The Real News Network.